Tagging Equipment There are 38 products. This listing is for a brand new Tagging Gun. This is the 'Fine' version of our tagging gun for use with delicate items such as thin garments and other such materials. Next working day delivery is provided viaRoyal Mail's 1st Class delivery serivceand a VAT invoice will be enclosed with your order. This listing is for a brand new Tagging Gun. This is the 'Fine' version of our tagging gun for use with delicate items such as thin garments and other such materials. The tagging gun comes with 5,000 White 25mm kimble tags, needle cover, wrist cord and instructions. This listing is for a brand new Tagging Gun. This is the 'Fine' version of our tagging gun for use with delicate items such as thin garments and other such materials. The tagging gun comes with 5,000 White 35mm kimble tags, needle cover, wrist cord and instructions. This listing is for a brand new Tagging Gun. 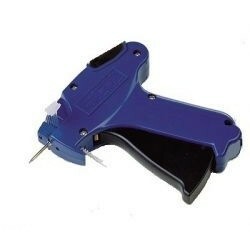 This is the 'Fine' version of our tagging gun for use with delicate items such as thin garments and other such materials. 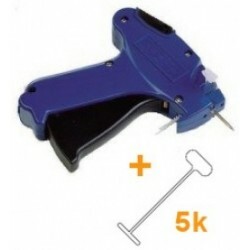 The tagging gun comes with 5,000 White 50mm kimble tags, needle cover, wrist cord and instructions. This listing is for a brand new Tagging Gun. This is the 'Regular' version of our tagging gun for use with thicker items such as thin garments and other such materials. Next working day delivery is provided viaRoyal Mail's 1st Class delivery serviceand a VAT invoice will be enclosed with your order. This listing is for a brand new Tagging Gun. This is the 'Regular' version of our tagging gun for use with thicker items such as jumpers, jeans and other such materials. The tagging gun comes with 5,000 White 15mm Kimble tags, needle cover, wrist cord and instructions. This listing is for a brand new Tagging Gun. This is the 'Regular' version of our tagging gun for use with thicker items such as jumpers, jeans and other such materials. The tagging gun comes with 5,000 White 25mm Kimble tags, needle cover, wrist cord and instructions. This listing is for a brand new Tagging Gun. This is the 'Regular' version of our tagging gun for use with thicker items such as jumpers, jeans and other such materials. The tagging gun comes with 5,000 White 40mm Kimble tags, needle cover, wrist cord and instructions. This listing is for a brand new Tagging Gun. This is the 'Regular' version of our tagging gun for use with thicker items such as jumpers, jeans and other such materials. The tagging gun comes with 5,000 White 50mm Kimble tags, needle cover, wrist cord and instructions. This listing is for a brand new Tagging Gun. This is the 'Regular' version of our tagging gun for use with thicker items such as jumpers, jeans and other such materials. The tagging gun comes with 5,000 White 75mm Kimble tags, needle cover, wrist cord and instructions. This listing is for a brand new Tagging Gun. This is the 'Regular' version of our tagging gun for use with thicker items such as jumpers, jeans and other such materials. The tagging gun comes with 5,000 White 25mm hook tags, needle cover, wrist cord and instructions.